The #Football World Cup: This Time for Twitter | United We Blog! It feels like everybody in the world is in one room watching the match together. Every World Cup tournament is a watershed in the history of football. With the stunning display of human emotions and talents, the game rejuvenates millions of people around the world. Those who watch the games will talk about that magical goal by that particular superstar for months and years. Those goals or missed chances, in many ways, define that particular World Cup. 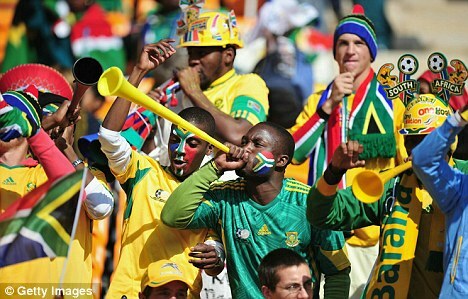 I am not sure, as of now, what will define the 2010 edition: vuvuzela or Twitter. These are the two things whose association with the game evokes contrasting feelings in me. I dislike the “stadium horn” as much as I like the express-in-140-characters social networking site. This and many other electronic conversations that I have had with many of my friends and strangers on Twitter have greatly enriched my World Cup experience like never before. This is the first World Cup that I am watching all alone in my quiet apartment in New Delhi. 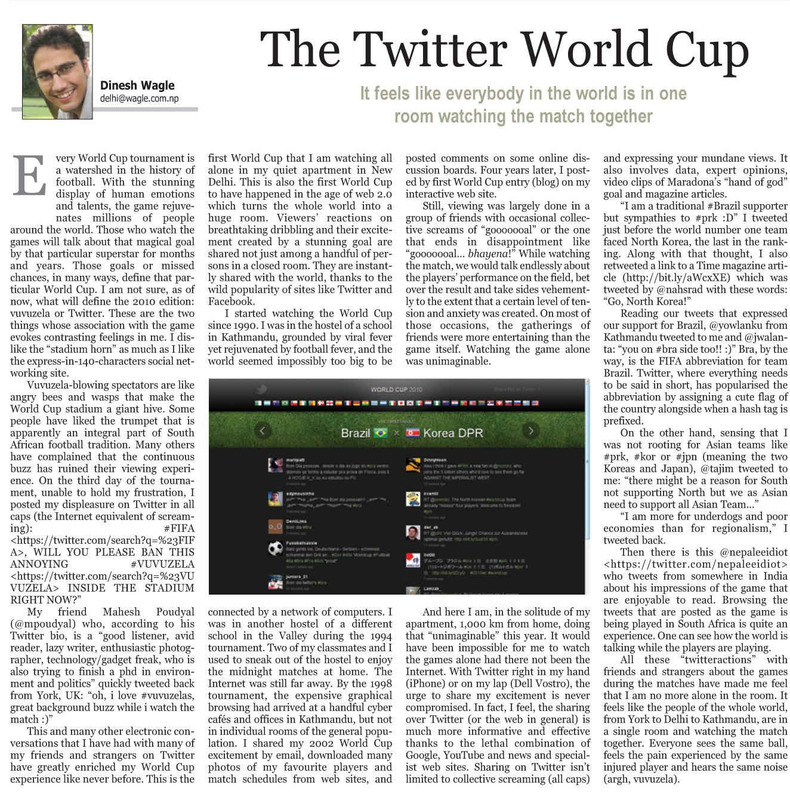 This is also the first World Cup to have happened in the age of web 2.0 which turnsthe whole world into a huge room. Viewers’ reactions on breathtaking dribbling and their excitement created by a stunning goal are shared not just among a handful of persons in a closed room. They are instantly shared with the world, thanks to the wild popularity of sites like Twitter and Facebook. I started watching the World Cup since 1990. I was in the hostel of a school in Kathmandu, grounded by viral fever yet rejuvenated by football fever, and the world seemed impossibly too big to be connected by a network of computers. I was in another hostel of a different school in the Valley during the 1994 tournament. Two of my classmates and I used to sneak out of the hostel to enjoy the midnight matches at home. The Internet was still far away. By the 1998 tournament, the expensive graphical browsing had arrived at a handful cyber cafés and offices in Kathmandu, but not in individual rooms of the general population. I shared my 2002 World Cup excitement by email, downloaded many photos of my favourite players and match schedules from web sites, and posted comments on some online discussion boards. Four years later, I posted my first World Cup entry (blog) on my interactive web site. Still, viewing was largely done in a group of friends with occasional collective screams of “gooooooal” or the one that ends in disappointment like “gooooooal… bhayena!” While watching the match, we would talk endlessly about the players’ performance on the field, bet over the result and take sides vehemently to the extent that a certain level of tension and anxiety was created. On most of those occasions, the gatherings of friends were more entertaining than the game itself. Watching the game alone was unimaginable. And here I am, in the solitude of my apartment, 1,000 km from home, doing that “unimaginable” this year. It would have been impossible for me to watch the games alone had there not been the Internet. With Twitter right in my hand (iPhone) or on my lap (Dell Vostro), the urge to share my excitement is never compromised. In fact, I feel, the sharing over Twitter (or the web in general) is much more informative and effective thanks to the lethal combination of Google, YouTube and news and specialist web sites. Sharing on Twitter isn’t limited to collective screaming (all caps) and expressing your mundane views. It also involves data, expert opinions, video clips of Maradona’s “hand of god” goal and magazine articles. Reading our tweets that expressed our support for Brazil, @yowlanku from Kathmandu tweeted to me and @jwalanta: “you on #bra side too!! :)” Bra, by the way, is the FIFA abbreviation for team Brazil. Twitter, where everything needsto be said in short, has popularised the abbreviation by assigning a cute flag of the country alongside when a hash tag is prefixed. “I am more for underdogs and poor economies than for regionalism,” I tweeted back. Then there is this @nepaleeidiot who tweets from somewhere in India about his impressions of the game that are enjoyable to read. Browsing the tweets that are posted as the game is being played in South Africa is quite an experience. One can see how the world is talking while the players are playing. All these “twitteractions” with friends and strangers about the games during the matches have made me feel that I am no more alone in the room. It feels like the people of the whole world, from York to Delhi to Kathmandu, are in a single room and watching the match together. Everyone sees the same ball, feels the pain experienced by the same injured player and hears the same noise (argh, vuvuzela). as a gender specialist i have no comments on footbal nepaleeidiot is sometimes my neigbour boy am i glad he is somewhere ha ha. hard to get women fascinated by it . tracked and maintained by the league. It starts with conhecting with the Kinsmen and rebuilding any ties of your kids.